Academics, tech enthusiasts, and professional engineers are all part of the Crowd Supply community and part of our focus for bringing SYZYGY and Brain-1 to market. Opal Kelly, a leading producer of powerful FPGA modules that provide essential device-to-computer interconnect using USB, announced the release of the SYZYGY™ Brain-1, an open, modular ARM + FPGA development platform featuring the SYZYGY open standard for FPGA peripheral interconnect. Announced earlier this year, SYZYGY is an open standard for connecting high-performance peripherals to FPGA hardware. SYZYGY is intended to satisfy the need for a compact, low cost, low pin-count, high-performance connectivity solution between FPGAs and single-purpose hardware peripherals. The Brain-1 is an open source carrier platform supporting the use of SYZYGY for modular peripheral expansion. The Brain-1 includes a Xilinx Zynq processor combining an ARM Cortex-A9 with a programmable FPGA. With four SYZYGY ports, the platform features modular expansion to high performance peripherals with applications such as high speed data acquisition, machine vision, software-defined radio, robotics, and sensing. Additional Brain-1 features include gigabit ethernet, 1 GiB DDR3 memory, a micro-SD slot, USB Type C on-the-go port, and JTAG. 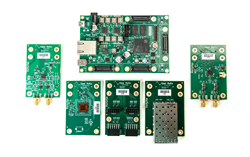 Three SYZYGY Standard ports and one SYZYGY Transceiver port are available to the Zynq processor. Linux has been ported to the platform and supported by a board support package created by Opal Kelly. This board support package is part of the open source assets provided to the community. Opal Kelly has partnered with Portland-based crowd funding platform Crowd Supply to release and distribute the Brain-1 through the Crowd Supply platform. "Crowd Supply is the perfect launch platform for the Brain-1," said Jake Janovetz, President of Opal Kelly Incorporated. "Academics, tech enthusiasts, and professional engineers are all part of the Crowd Supply community and part of our focus for bringing SYZYGY and Brain-1 to market. As an open standard, SYZYGY is about providing useful standardization to a broad market. Releasing the Brain-1 and several peripherals as open source projects and getting community support is an important part of that contribution." "Working together was a no-brainer for Crowd Supply," said Josh Lifton, founder and CEO of Crowd Supply. "The SYZYGY project looks really interesting and fits very well with the kinds of projects and audience we've been busy with lately." Brain-1 will be available through Crowd Supply for $325.00 including power supply and microSD card. Additional peripherals available for the initial launch include: high-speed ADC, high-speed DAC, color image sensor, a carrier for pluggable transceiver modules, and a Digilent Pmod™ Compatible expansion module. The Pmod expansion module will give the Brain-1 access to dozens of existing peripherals already compatible with Digilent's Pmod specification. Opal Kelly, founded in 2004, offers a range of powerful, off-the-shelf, USB-based FPGA modules, including the easy-to-use Opal Kelly FrontPanel™ software interface and robust API. Opal Kelly products provide the essential device-to-computer interconnect for efficient and fast product prototyping, testing, development, and OEM integration. Development engineers, researchers, teachers and serious hobbyists, worldwide, use Opal Kelly modules for an efficient and economical interconnect solution that shortens development time, fills expertise gaps, and dramatically accelerates time to market. For more information, or to download the SYZYGY Specification, please visit syzygyfpga.io or the Brain-1 Crowd Supply campaign.